Things wear out. Running shoes included, but how do you know when it’s time for you to get a new pair or if your current shoes are even right for you? Current guidelines suggest changing shoes after approximately 600-1000 km of road use. So that’s every 6-12 months for an amateur runner. So your shoes have reached their limit. “What do I get now?” you ask. Go with what’s comfy! Try and run with them on in the store first if you can. Also, do not change the type of shoe by a lot, slow change is the best change! 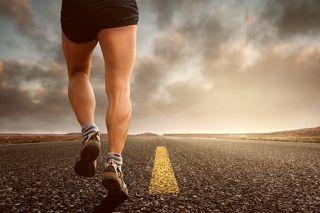 A lighter shoe can also lead to better performance but if you are used to running with lots of support don’t go switching to the barefoot style or minimalist shoes right off the bat. Remember slow changes are the best changes! Now how do you know if the shoes are the right fit for your running style? If you are feeling any pain or discomfort while running that is a good starting point. There are certain styles of shoes that may help depending where your pain is. That prescription should be guided by one of our Physios as we can determine what the source of your discomfort is and advise you on the best shoe type for you. Running pain free also depends a lot on your running “load” management and your associated strength and conditioning. The right advice in these areas make a big difference. If you need a hand with any of this give us a call and we can get you Back to Health so you can become the best runner you can be!